We’d love your help. Let us know what’s wrong with this preview of The Pieces of You and Me by Rachel Burton. ‘A beautiful story of second-chance love between two perfectly imperfect characters. Rachel writes with such emotional honesty, it leaves me lost for words.’ Sarah Bennett She’d turned her back on love. But fate had other ideas. A powerful and uplifting second chance love story to make you laugh and cry, perfect for fans of Katie Marsh, Sheila O’Flanagan, and Amanda Prowse. To ask other readers questions about The Pieces of You and Me, please sign up. Gem, I know you’re over the moon about getting married and I’m delighted for you, but it doesn’t mean that you get to matchmake. Even if I am the last one left on the shelf. We were born twelve hours apart – you at six p.m. and me the following morning – in the same hospital, our mothers recovering in beds next to each other… You were early and I was late, which was the pattern that continued for the rest of our lives. You were always waiting for me to catch up with you. Too young to be here, too old not to be. We’d always done terrifying things together. It felt like the first time we jumped into the deep end of the swimming pool, hand in hand, as children. Looking back on it now with the advantage of age and hindsight I realised how foolish I’d been, how foolish we are when we’re young. Maybe that alone was reason enough for us to have gone our separate ways. I had been too young to understand nuanced grey areas of thought back then, too young to understand discretion and diplomacy and how sometimes we have to say things we don’t really mean just to keep the peace. One of my favorite tropes just so happens to be second-chances, and this couple was more than deserving of a rekindled relationship as they had each been living a rather miserable half-life while a decade apart. Serious health and family issues and tendencies to live too deeply inside their own heads further compounded their pressures and littered their path with landmines. This could easily have been a maudlin tale but Ms. Burton craftily shaped and paced her endearing flawed yet stubborn characters’ insights, memories, and encounters to circumvent the reader falling into the pit of despair. While the narrative was often melancholy and angsty - which typically has me twitching and sighing in agony – I am absolutely astounded to report that I didn’t seem to mind. Ms. Burton may well have deployed some sort of magical word voodoo on her book file as, despite the angst, the tender quality and ingenious tempo of her superb storytelling kept me fully engaged, deeply invested, and intensely curious about their slowly unraveling and intriguing story. Contemplating this surprising and momentous phenomenon leaves me rather astonished and blinking in amazement. Such a sly wordsmith deserves a five-star rating for that alone. The Pieces of You and Me is a poignant and compelling read about relationships, starting again, illness, and second chances. Jess and Rupert were childhood sweethearts and best friends. But as they grew up things happened and they broke up and drifted apart. Fast forward a good few years and a chance meeting sees them together again after so long apart. As feelings and emotions resurface can Jess and Rupert put the past behind them and give love a second chance? What I really enjoyed most about this book was the raw and honest insight into invisible chronic illness. I have rheumatoid arthritis and every day is a battle, a tiresome battle. I too suffer from fatigue and it literally knocks you for six. It's so nice and refreshing to see invisible chronic illness represented in such a heartfelt way. The Pieces of You and Me is a compelling and heart warming romance, told by Jess and Rupert viewpoints, i found the pace to be slower as the story progresses over the years which fits in perfectly, the characters are well thought out, flawed, and somewhat relatable. This is a story of second chances, finding love, coping with illness, loss, relationships, family, secrets, drama and starting over. So if you enjoy your women's fiction with a contemporary romance twist that's full of angst, uncertainty, Emotion, and romance then you will really enjoy The Pieces of You and Me. A sweet second chance romance that put a smile on my face and a warm feeling in my heart! I do love a good second chance romance, however nine times out of 10 I get frustrated at the lack of communication that went on in the first relationship that ultimately lead to the need for a second chance romance. This was definitely one of those books, don’t get me wrong I thoroughly enjoyed it I just felt the desire to reach through the pages and shake some people a couple times. Do you ever find yoursel A sweet second chance romance that put a smile on my face and a warm feeling in my heart! I do love a good second chance romance, however nine times out of 10 I get frustrated at the lack of communication that went on in the first relationship that ultimately lead to the need for a second chance romance. This was definitely one of those books, don’t get me wrong I thoroughly enjoyed it I just felt the desire to reach through the pages and shake some people a couple times. Do you ever find yourself talking to your book? Thinking perhaps the characters will explain to you why they are acting the way they are? No? It is just me? Jessie and Rupert have been the best of friends since birth. Their friendship turned into romance when they were teenagers, but then abruptly ended when Rupert went off to college in the US. 10 years later Rupert and Jesse have a chance encounter, sparks are rekindled, but can they ever find the flame again? Time has changed many things and they are not the same two lovestruck teenagers they were a decade ago. Is true love a choice or is it fated? Jesse and Rupert were both very well drawn multidimensional characters who I really liked. Although the back and forth between them was tedious at times, they both really needed a good friend to talk some major sense into them! Their friends all seem to think they were perfect for one another, however nobody told them just to stop with the nonsense and get on with it! Rachel Burton is a beautiful writer, the emotion and angst in this book just poured off the pages. The story is told from both Jesse and Rupert‘s point of view, along with Jessie‘s old diary entries. I thought this was tremendously impactful we really got to see the entire picture. Jessie suffers from chronic fatigue syndrome and I felt as though that was well explained and well researched, it is a disease I don’t entirely understand, but now I do have a better picture. Beautifully told and packed with wonderful characters, second chances, angst, and love! Recommend! There’s no such thing as fate, we are all responsible for our own happiness. This is a book that is difficult to put down once you have begun reading it. It holds the reader as the plot unfolds. The author has done an excellent job in creating characters that are multidimensional. The fear of having your body unexpectedly betray you and the struggles to overcome resultant difficulties are well delineated. This great story highlights that relationships are really hard, careers require a lot of a person and take a personal toll, and people make regrettable mistakes in judgment. It felt awkward, like forcing two jigsaw pieces that didn’t fit. This is a wonderful story and it is well written with believable characters. There are so many lessons to be learned here. I think people should read this book and take it to heart. We should never take our loved ones for granted. This book shows how life happens when you're making other plans and how to deal with all of the situations when you think you have a handle of how life should be. Was I finally learning that there is no such thing as perfection? I liked the short chapters and that each one changed points of view, from Jess to Rupert and back. I also enjoyed that the story shows past and present. This story was about love, love almost lost and coming together as a couple in sickness. The story seemed real and the emotions shown sometimes made me want to tear up. I was immersed in the lives of these characters. A sure sign for me that this was written from the heart. Thank you NetGalley, HQ Digital and Rachel Burton for the opportunity to read this book in exchange for an impartial review; all opinions are my own. 3.25/5. It was always going to be Rupert and Jess together - until it wasn't. They were childhood friends turned lovers and planning their forever. But tragedy struck and neither were able to cope with the devastation. Instead of drawing closer they grew apart and then the relationship was abruptly severed, torn asunder by grief, by interfering family and their youth and lack of coping skills. A serendipitous meeting a decade later gives them the second chance they both have been waiting for, ex 3.25/5. It was always going to be Rupert and Jess together - until it wasn't. They were childhood friends turned lovers and planning their forever. But tragedy struck and neither were able to cope with the devastation. Instead of drawing closer they grew apart and then the relationship was abruptly severed, torn asunder by grief, by interfering family and their youth and lack of coping skills. A serendipitous meeting a decade later gives them the second chance they both have been waiting for, except once again, love might not be enough to keep them together. The writing was decent although there was too much telling and not enough showing. Furthermore, I was left somewhat frustrated by the characters. The reasons for their initial split was flimsy and I am not sure why they did not try to maintain communication. (view spoiler)[ She slept with their mutual friend, Dan, within 2 weeks of their parting, which I cannot comprehend. She then felt in love with Dan while still apparently loving Rupert. Nooooo... that just didn't work for me. Then Dan came back and she needed emotional closure with him behind Rupert's back and with that, Jess just lost any remaining credibility for me. (hide spoiler)] I don't quite get the author's decision to have alternating dual narration, one from Jess's first person POV and the other from Rupert's perspective but in third person narration. Why not both first person or third person narrations? Jess and Rupert parted company a decade ago after tragedy, and their responses to it, drove them apart. Years later, their paths cross again, but so much has changed for them both in the intervening years, will it really be possible to forge a new relationship? I fell in love with Rachel Burton’s books from the beginning, and this one is no exception. Told with three contrasting narrative styles, Jess’ first person account, Rupert’s voice in the third person and Jess’ diary from years past, these three pieces of the story seem structurally to reflect the conflicts that the characters face in the narrative. How those three pieces fit together to form a coherent whole is perhaps a metaphor for the characters’ own journey towards reconciliation and a future either together or apart. The struggles the characters face are presented truthfully, and the sense of place in this novel is equally strong. Rachel Burton creates characters, both human and canine, who sing from the page, and I felt as though I was living Jess and Rupert’s lives as I was reading. It’s a wonderful gift for a storyteller, and she’s really going from strength to strength with every book. Burton’s prose has always reminded me of that other great romantic writer, David Nicholls, and the sense of melancholy in this novel is reminiscent of One Day. That is not to say that this is a novel without hope and humour – both are present here, in the lives of these skilfully created characters. Achingly romantic, beautifully realised and the perfect way to spend a winter’s afternoon, this is a book that’ll stay with you long after you finish it. I adored it. I loved Rachel's The Things We Need To say, and really expected to love this one too. I didn't. though its beautifully written and tackles some tough subjects. As someone who has CFS myself I understood how ill Jess felt at times, and how others simply can't understand that overpowering fatigue. I loved Jess and Rupert as people, and indeed there were some great secondary characters. It was just the main thrust of the story, the break up and getting together, that didn't work for me. I didn't really understand why they parted, and felt when they resumed their relationship they still didn't understand themselves what went wrong. I felt like I had all these questions about it, and I was waiting all through for answers but never really got them. In contrast to TTWNTS I felt there wasn't any real focus for me in this story, that it just didn't have anything I could grip, any hopes of solutions, just unanswered questions. Without those answers I wasn't sure if the same thing would happen all over again to them. Stars: Three, a well written story, but it just didn't work for me. Could be just what you want though, reading is incredibly subjective. This was such an emotional book, I felt like I could sympathise with Jessie as I suffer from a similar illness. It was emotional but also very charming to read. However I did feel as if it started to drag on a little bit when they wouldn’t communicate and were hiding things from each other. I felt like it was a way to stretch the story on a little bit. I just wanted them to sort it out get married and have a perfect little family just like they wanted. I did love how Rachel managed to describe h This was such an emotional book, I felt like I could sympathise with Jessie as I suffer from a similar illness. It was emotional but also very charming to read. However I did feel as if it started to drag on a little bit when they wouldn’t communicate and were hiding things from each other. I felt like it was a way to stretch the story on a little bit. I just wanted them to sort it out get married and have a perfect little family just like they wanted. I did love how Rachel managed to describe how ME is, I find it very hard to explain my symptoms so I want to say well done for capturing and explaining the symptoms so very well it takes real talent to get across how an illness can affect you especially with an ‘invisible illness’ like ME or chronic fatigue syndrome. One of the things I love about Rachel Burton’s books is the way she manages to capture my attention from the very start. The style that she has is just so effortless and it was clear that this was a journey that I was going to really enjoy. The story is told through three perspectives, we get the present day through Jess and Rupert and the past through some of Jess’s diary entries. I enjoyed the dual timeline it meant that you got a better sense of how much the characters meant to each other and One of the things I love about Rachel Burton’s books is the way she manages to capture my attention from the very start. The style that she has is just so effortless and it was clear that this was a journey that I was going to really enjoy. The story is told through three perspectives, we get the present day through Jess and Rupert and the past through some of Jess’s diary entries. I enjoyed the dual timeline it meant that you got a better sense of how much the characters meant to each other and cemented how difficult their separation was. Although I have to admit to a little niggle, the diary sounded more like a letter to Rupert rather than Jess just writing in her diary, all the same things could have been said but sometimes it just kept popping into my head who writes a diary to someone. I am a sucker for a second chance romance and from the start there is this hint toward the tension between Jess and Rupert. It didn’t take me long before I was questioning what was it that happened between them and wondering how they will work to move past it. I loved the chemistry between them, even with the uncertainty that Jess is feeling at the beginning, you can still feel that connection and I was immediately rooting for them. I really liked both Jess and Rupert they were both so strong and vulnerable and that worked really well as a dynamic between them. The author has a knack for writing the most beautifully flawed characters, this isn’t a fairytale romance, it’s realistic and the characters are more endearing for it. I could empathise a lot with Rupert, his habit of keeping everything in until he can’t cope, letting his feelings get the better of him and reacting irrationally to such extreme emotion, that really spoke to me but I liked that he never took long to realise when he was in the wrong. I liked that Jess had such determination, she has an illness that has completely changed the course of her life but she doesn’t let it keep her down, she creates something new from it. I don’t think I fully appreciated the kind of impact that such an illness can have on your life, especially when it’s something that can’t be tested for, so I’m glad to have been introduced to this perspective. There was however something that just didn’t sit entirely right with me and that was part of the reasoning behind their split, I could understand a lot of it but it was also resting on the fact that Rupert essentially cuts all ties with everyone and I don’t think I found that believable. I also think that there was a point in the book when they were having communication problems that it started to feel a little repetitive, probably very true to life, but it did mean that my attention waned slightly. Despite that I still loved the journey these characters had to take and really wanted them to get a happy ending. Another wonderful book from Rachel Burton, she is definitely one of my go-to authors and I excited to see what comes next. It seems as though Rupert and Jess have always been friends, even in their childhood. They were soul mates and knew each other so well and felt a connection that was all encompassing. As they grew up they were only parted by attending different schools, but as soon as they were back at home again, the resumption of the old friendship seemed the most natural thing in the world. It was cherished and it blossomed into a teenage romance. Then suddenly it was all over; they weren’t a couple any more. It seems as though Rupert and Jess have always been friends, even in their childhood. They were soul mates and knew each other so well and felt a connection that was all encompassing. As they grew up they were only parted by attending different schools, but as soon as they were back at home again, the resumption of the old friendship seemed the most natural thing in the world. It was cherished and it blossomed into a teenage romance. Then suddenly it was all over; they weren’t a couple any more. Rupert moved to a college in the States, and that was that. Neither of them could really understand how it suddenly happened or even why it happened. Their trust in each other was fractured. There was nothing else to say, although they both felt distraught. They got on with their thereafter lives and they both had other relationships. In fact they only met again by accident ten years after they first parted. Rupert was back but he wasn’t living at home, he was living miles away. They were both single through choice. This heartwarming story tells the whys and wherefores and the intricacies of Rupert and Jess’s relationship. It is a compelling story about missed opportunities, misunderstandings, misapprehensions, lacking experience and misreading between the lines. The attraction between them was immediate. Everyone could see it. Should they try again? Both felt incomplete without the other, but the gap of a decade made their second chance fledgling romance a huge step to take, with neither of them unable to forget the hurt, the devastation and the aching pain of separation. Could they resolve their issues? Secrets held by both of them would surely ruin their second chance romance, or could they work through their issues and become the perfect couple once again? It was a choice for debate: What might have been or what could be? I really enjoyed reading this tender romance story. I loved both of the main characters. I saw their frailty, their flaws, their hopefulness, their care and compassion for each other and I really wanted their relationship to be successful. It was just their secrets that hung between them, made them each vulnerable and reticent, but also having faith in their feelings for each other. I loved the way the author created two characters that were so similar but also so dissimilar. I loved the issues she introduced and dealt with masterfully. I would like to thank NetGalley and publisher H Q Digital for my copy of this beautifully written story, sent out to me in return for an honest review. These are my own opinions and are uninfluenced by anyone else. It’s a solid 4* review from me and a recommendation that this is a really lovely story. When Jess bumps onto her ex, Rupert at her best friend's hen party, it's immediately obvious that there is unfinished business between the couple. It's also very clear that their feelings for one another never really went away. With most of their family and friends keen to see the pair reunited, this looks like a second chance for love. They both still need to face up to the events which led to them breaking up in the first place and be honest with themselves and each other about how the interve When Jess bumps onto her ex, Rupert at her best friend's hen party, it's immediately obvious that there is unfinished business between the couple. It's also very clear that their feelings for one another never really went away. With most of their family and friends keen to see the pair reunited, this looks like a second chance for love. They both still need to face up to the events which led to them breaking up in the first place and be honest with themselves and each other about how the intervening ten years has changed them. The story is told from both their viewpoints - in the case of Jess, either from her first person perspective in the present day or through a journal she wrote years ago which recalls their childhood friendship which eventually evolved into first love until their emotional split at the airport when Rupert left for Harvard without her. Rupert's point of view is also set in the present but through a third-person narrative and between the three different ways of following their story, I was able to gain a clear insight into their relationship and to be in the position of understanding the reasons behind their relationship stalling before they did. I suspect this will mean that those desperately hoping for the happy ever after will find the behaviour of Jess and Rupert frustrating at times. It's true that they are both guilty of withholding secrets which leads to suspicion and jealousy but I could see they they are scared of revealing their flaws in case it drives the other away, even if their fear of being hurt risked jeopardising their second chance at love. While there were moments when I wished they were ready to express their doubts, I could easily empathise with their reticence at sharing their secrets. Some of the most moving parts of the story, for me were Jess' attempts to come to terms with her M.E. diagnosis. Although she was diagnosed years ago and for the most part has learned how to manage her condition, meeting Rupert again reveals that she hasn't fully reconciled herself emotionally with her new normal. Rachel Burton's own experience as a M.E. sufferer means she can write about this still little understood illness with honesty and clarity. One of the things I really loved about Jess is that she refuses to let her health issues define her and has developed ways of coping which have allowed her to achieve professional success. I couldn't help but hope that she'd eventually find the courage to open up to Rupert but I understood her concerns; unfortunately not everybody is able to cope with the chronic illness diagnosis of a loved one and it's not surprising that she was frightened of his response. Meanwhile, it transpires that Rupert hasn't had the easiest time of it either and still needs to confront his own issues. He also fears what Jess will say if he shares his secret with her but with the pair both too afraid to truly open up, a sense of mistrust and doubt begins to tarnish their fragile reconciliation. They also need to discuss what caused their relationship to fall apart ten years ago; as a reader, with the benefit of omnipotence, there are moments when it is baffling to see how the couple allow things to go unsaid rather than have a difficult conversation. Life can be like that however, and at our most emotionally charged times, it's not always easier to have the courage or the foresight to truly express ourselves. The Pieces of You and Me is an touching and honest character-driven novel which is an engaging and realistic look at second chance love. I thoroughly enjoyed it and recommend it to anybody who enjoys romantic novels which explore the realities of having to work at love amidst the baggage which we inevitably all amass as we progress through life. Rupert and Jess were meant to be together – they’ve known that since the day they were born, side by side in the same hospital ward. But when life insists on breaking you, piece by piece, is love really enough to conquer all? Ten years after life derailed their relationship, a chance meeting at a mutual friend’s wedding brings these childhood friends together again. After a decade regretting how they broke up, it seems that fate has granted them a second chance. But the past doesn’t always let go Rupert and Jess were meant to be together – they’ve known that since the day they were born, side by side in the same hospital ward. But when life insists on breaking you, piece by piece, is love really enough to conquer all? I loved this emotional read, which felt mature, nuanced and well-developed. The theme of illness, both physical and mental, and how it can alter our lives forever was particularly poignant and well-conveyed by the author. Part of the narrative is given in the form of journal entries and in fact the confidential tone throughout, particularly in Jess’s first-person point of view, reminded me of a diary or letter: a joy to read. The two main characters were realistically flawed and vulnerable, and I was rooting for them from the beginning. I have spent the entire day reading this. Could not put it down. This is a book which will take you on an emotional journey. I feel like I have experienced something which is always a sign of a good book. This story of Jess and Rupert has unearthed loads of teenage romance memories for me. I related to their early relationship so much, practicing kissing with a boyfriend, dealing with interfering parents who have other plans for your futures, the jealous feelings you have when around others Wow! This story of Jess and Rupert has unearthed loads of teenage romance memories for me. I related to their early relationship so much, practicing kissing with a boyfriend, dealing with interfering parents who have other plans for your futures, the jealous feelings you have when around others, the stories you tell yourself about the relationship and the urge to put distance between each other when things don’t feel right. I loved the tension Dan and Camilla caused between Rupert and Jess and it was cleverly written. This book was a good insight into the daily struggles experienced with living with a chronic illness and how it can impact a relationship. I would just like to say Rupert is a very attractive male character and if he ever fancies walking through an orchard with me.... I am there! So glad I bought and read this. Loved this book! I’ve been a fan of Rachel Burton’s work since reading her debut novel, The Many Colours of Us in 2017. Rachel writes seamless contemporary novels with rather wistful undertones. I’m a huge fan of ‘the one that got away’ trope and The Pieces of You and Me is about two wonderful characters who have a second-chance at love. Of course, there’s turbulence along the way, as both characters have pasts to address and, refreshingly, the heroine is struggling on a day-to-day basis with chronic illness whi I’ve been a fan of Rachel Burton’s work since reading her debut novel, The Many Colours of Us in 2017. Rachel writes seamless contemporary novels with rather wistful undertones. I’m a huge fan of ‘the one that got away’ trope and The Pieces of You and Me is about two wonderful characters who have a second-chance at love. Of course, there’s turbulence along the way, as both characters have pasts to address and, refreshingly, the heroine is struggling on a day-to-day basis with chronic illness which shines a light on the subject of invisible illness, which I found quite poignant in these modern times when people are becoming more aware of the issues of others. I absolutely adored the hero, Rupert, but was drawn to all the characters. I don’t want to give much away but I’d highly recommend this book. Thank you to the author and Rachel’s Random Resources for providing me with a free copy in exchange for an honest review. Now who doesn’t love a second change at love sort of book and Jess and Rupert definitely take us on an emotional journey! Not only was this a great contemporary read it also gave so much more depth with having to deal with a chronic illness. This was a good book to get engrossed with on a Saturday afternoon, though at points it did seem a little slow with everything going on b Thank you to the author and Rachel’s Random Resources for providing me with a free copy in exchange for an honest review. Now who doesn’t love a second change at love sort of book and Jess and Rupert definitely take us on an emotional journey! Not only was this a great contemporary read it also gave so much more depth with having to deal with a chronic illness. This was a good book to get engrossed with on a Saturday afternoon, though at points it did seem a little slow with everything going on but I think that had to do with a lack of communication between the characters, there was some definite internal screaming from me going on. This was my first book by Rachel Burton but I will be checking out her other two as soon as I can, although frustrating at points I really did like how the story was set out and the writing really brought it alive. Four out of five stars! This is the story of Jess and Rupert. They were childhood friends who became a couple early on in their teens. Along the way, situations occurred which broke them apart. Did they ever get past the hurt? Could they put their past in the past and move on with their lives? Now a decade later, fate has brought these two friends back together again. Can they go back to being friends? Can they trust each other enough to let the truth come out? Can they go back to being “that” couple again? This story This is the story of Jess and Rupert. They were childhood friends who became a couple early on in their teens. Along the way, situations occurred which broke them apart. Did they ever get past the hurt? Could they put their past in the past and move on with their lives? Now a decade later, fate has brought these two friends back together again. Can they go back to being friends? Can they trust each other enough to let the truth come out? Can they go back to being “that” couple again? This story is one of loss, love and second chances. I liked that it was written from Jess’ point of view and also Rupert’s, which gave you deeper insight into the characters. All in all a beautiful story. Thank you to NetGalley for an advanced copy of the book to review in exchange for my honest review. A beautifully crafted love story that is well-grounded in the real world. It's not all fairytales and billionaire businessmen. This is the real deal. Love can be hard. It's not enough just to fall in love, you have to work at it to stay together. You have to take what life throws at you, join forces and become stronger in the face of it. There are some fabulous secondary characters too, doses of nostalgia and splashes of humour which really make you smile - a pepper pot anyone?! And the way Rach A beautifully crafted love story that is well-grounded in the real world. It's not all fairytales and billionaire businessmen. This is the real deal. Love can be hard. It's not enough just to fall in love, you have to work at it to stay together. You have to take what life throws at you, join forces and become stronger in the face of it. Jess is attending her friend Gemma's hen night when she bumps into a face from her past. One she has not seen for ten years and who was once her first love. Rupert was not surprised to bump into Jess after all these years as he has been in touch with Gemma over the years and is not surprised to see Jess there. What does surprise him is the feelings that all coming rushing back to him since he last saw Jess and he is keen to get to know her again and be part of her life again too. Jess and Rupert Jess is attending her friend Gemma's hen night when she bumps into a face from her past. One she has not seen for ten years and who was once her first love. Jess and Rupert start talking and they both realise the feelings are still there but they are both very cautious about starting the relationship again. Things start off slowly between the two and they are both want to be happy. But with both of them keeping secrets with the relationship falter again or will love conquer all? This is a fantastic, heart warming and addictive read that I devoured in one day. I loved how the book was able to go between the past relationship between Jess and Rupert using the diary entries that were written by Jess. It gave you a great insight in how their relationship grew and how much they were in love. It also showed all of the hurdles they had to overcome and what finally drove them apart. I also liked that you got to read their story develop from Rupert side too and all parts flowed so well together and made the story complete. The issue of Jess's illness was handled very well and was obviously very well researched by Rachel. I also loved getting to know all the other characters in the book, they were all well written too and all added to the story giving you a good idea of how their relationship progressed. I throughly enjoyed this book from Rachel Burton and I am looking forward to see what Rachel writes next. Once again Rachel Burton has blown me away with a poignant romance entwined in the battles of the real world. The Pieces of You and Me is an enthralling love story that asks the question - can true love stand not just the test of time but the challenges we face along the way? Jess and Rupert are both fabulous and flawed and their story feels as real to me as the people I see every day. A down to earth and wonderfully uplifting story of love and second chances. You know what they say, sometimes it's the right person, but at the wrong time. I think that is what the relationship between Jess and Rupert is like. Sometimes life intervenes and throws obstacles in our path, which is how the two of them are drawn apart in the first place. Rupert is very insecure and jealous, perhaps because he has already lost so much time with Jess. His reaction to Dan is over the top and almost controlling. In fact I found it hard to find Rupert sympathetic at times. Chronic You know what they say, sometimes it's the right person, but at the wrong time. I think that is what the relationship between Jess and Rupert is like. Sometimes life intervenes and throws obstacles in our path, which is how the two of them are drawn apart in the first place. Chronic illness and ill health play a major role in this story. The way the healthy react to people with chronic conditions and more importantly how those with chronic conditions deal with life in general, especially when it's a condition like ME (chronic fatigue). There are still plenty of medical professionals who doubt the validity of the existence of said condition. I think perhaps the lack of understanding about how it takes a toll on the life of a person suffering from ME is more relevant to this story. Jess has good days and sometimes really bad ones, and any romantic partner has to be able to cope with the erratic nature of the condition. Jess knows from experience that it makes some men run in the opposite direction. It's a story about second chances, perhaps even fate in a way. It's women's fiction and contemporary fiction with a focus on friendship and compassion, rather than two people being swept away by passionate encounters. It's a slow burner with strong, yet at times quite self-serving characters. This is a book about love and second chances. Thebook was okay, but lacked chemistry. We were told they were in love, but I didn't really feel it. The reason Jess and Rupert stayed away from each other so long felt weak. It shouldn't have taken them so long. The story felt a bit repetitive, since they were discussing the same problems over and over again. This review has been hidden because it contains spoilers. To view it, click here. This was such an emotional book, I felt like I could sympathise with Jessie as I suffer from a similar illness. It was emotional but also very charming to read. However I did feel as if it started to drag on a little bit when they wouldn’t communicate and were hiding things from each other. I felt like it was a way to stretch the story on a little bit. I just wanted them to sort it out get married and have a perfect little family just like they wanted. I did love how Rachel managed to describe h This was such an emotional book, I felt like I could sympathise with Jessie as I suffer from a similar illness. It was emotional but also very charming to read. However I did feel as if it started to drag on a little bit when they wouldn’t communicate and were hiding things from each other. I felt like it was a way to stretch the story on a little bit. I just wanted them to sort it out get married and have a perfect little family just like they wanted. I did love how Rachel managed to describe how ME is, I find it very hard to explain my symptoms so I want to say well done for capturing and explaining the symptoms so very well it takes real talent to get across how an illness can affect you especially with an ‘invisible illness’ like ME or chronic fatigue syndrome. Absolutely loved this story! I think this might be Rachel's best one yet! I loved the characters, the setting and I felt like the subject matter was tackled very sensitively. But what else would you expect from Rachel. Can't wait for the next one! I read this on holiday after some trying weeks and it was the perfect comfort read. It's achingly beautiful and tender. Rachel sublimely blends heartbreak and happiness in the pursuit of discovering ‘what if..?’ Simply gorgeous. Once again Rachel Burton writes a beautifully moving, poignant and wistful romance. 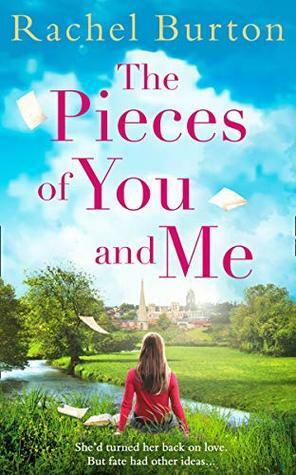 The Pieces of You and Me is Rachel Burton's third novel and although I've only read two of her books (including this one) I feel like this author's novels and her style of writing are going straight to my 'Favourite Author' list. The Pieces of You and Me was so effortlessly written with the words and the story flowing beautifully taking you on an emotive journey with Jess and Rupert. Jess and Rupert were always destined to be together as they were born hours apart and lived close-by each other. G The Pieces of You and Me is Rachel Burton's third novel and although I've only read two of her books (including this one) I feel like this author's novels and her style of writing are going straight to my 'Favourite Author' list. The Pieces of You and Me was so effortlessly written with the words and the story flowing beautifully taking you on an emotive journey with Jess and Rupert. Jess and Rupert were always destined to be together as they were born hours apart and lived close-by each other. Growing up they had become best friends and were always there for each other. But then as childhood grew into young adults their feelings developed into love and it was if they were the pieces of a puzzle that were meant to be together. However, life, or fate, played it's part and ten years ago hearts were to be broken and their lives went separate ways. A lot has happened to Jess in the ten years since she's seen or heard from Rupert. She had to pick up the pieces of her heart and try and build them back together but they never truly fitted back correctly. Her personal life was to experience a huge hurdle that she would struggle to overcome and would still now find this hurdle rearing it's ugly head again. Rupert's heart broke ten years ago when he walked out of Jess' life, he's had to face many new hurdles himself that took him by surprise and he's had a long battle to face of his own. Now their paths have crossed again and it's as if the last ten years never took place. Feelings and memories come flooding back, but could they return to how they once were? Could their own battles in the last ten years leave barriers against their chance of happiness? The Pieces of You and Me is such a beautiful story of a love that never gave up. It's also a story of struggling with what life has thrown your way. The author, Rachel Burton, has written with honesty and with sensitivity. You can feel the emotional heartache and the physical strains that life has thrown at Jess and Rupert. I was totally swept away by Jess and Rupert's story and was heartened by their plight. Have you ever had one of those loves that you just cannot shake off no matter how hard you try? Jess and Rupert have! Childhood friends, teenage sweethearts and adult lovers, Jess and Rupert say goodbye. In the ten years they are apart, neither manages to get over the other and a fluke meeting in York ten years later brings them together again. But, they are no longer the same people and each one has their own secrets and heartaches to bring into the relationship. Has too much time passed or Have you ever had one of those loves that you just cannot shake off no matter how hard you try? Jess and Rupert have! Childhood friends, teenage sweethearts and adult lovers, Jess and Rupert say goodbye. In the ten years they are apart, neither manages to get over the other and a fluke meeting in York ten years later brings them together again. But, they are no longer the same people and each one has their own secrets and heartaches to bring into the relationship. Has too much time passed or can they finally complete their stories, together? I just adore the different devices used to tell the story. We have diary extracts from Jess, written as a young teen/adult and we get to relive her experiences through these writings. Told with the words of someone mature but definitely a teenager it's refreshing to look at things from this perspective. Your first real love is always special and I think the feelings it brings are captured beautifully in these extracts. In the present day we are told the story from two perspectives: Jess and Rupert. Throughout both narratives the missing pieces from the past ten years are revealed slowly so although there are hints to the secrets they are both hiding, you don't find out immediately. Jess is such a darling and her narrative is written beautifully to show her vulnerability and fears whilst not making her seem weak in character. I love the fact that we also get Rupert's perspective although his narrative reveals less about him that Jess's, it's great to read that point of view which is often not found in romance novels. From the very beginning you are rooting for Jess and Rupert, I mean - Rupert is like the perfect man. By not revealing everything at once, Ms Burton keeps the pages turning until the very end. As a reader, it is always a thrill to find a new author and novel which resonates with you. Pieces of You And Me is such a book and tells a story which will stay with me for a long while. Ten years after watching Rupert walk away for a new life in the US, Jess never expected to see him again. That's until they are both in the same pub in York. Much has changed in her life since then but is she strong enough to cope with seeing him again? Rupert never forgot Jessie, the only woman he's ever loved, yet he turned his back on their relationship to study at Harvard. Ten years later he wants to rekindle what they had, but has too much time passed for them to have a second chance? The narrative flowed effortlessly even though I'm not normally a fan of flashbacks. Written as Jessie's diary entries, I found it easy to keep astride of the novel and it provided insightful understandings of her feelings and connections not only for Rupert but others close to her too. Each new entry is like a piece of the jigsaw which eventually creates the happy ever after. Actions have consequences and all is not plain sailing. While the chemistry and attraction between the reunited pair are palpable, underlying issues have to be addressed and dealt with if they are ever going to find long-lasting happiness together. I like how the author brought all the emotions to the surface...it's relatable and easy for the reader to understand the feelings of all those wrapped up in this couple's life too. Every now and again, something within a narrative sparks a memory unrelated to the story I'm reading. Rupert and Jessie's story triggered thoughts from a time gone by. Who knew the mention of Highgate and York would do this? Certainly not me. My connection to these two places is very different, however, I still enjoyed a trip down memory lane while reading this book. Second chance romance is a favourite trope and I quickly became invested in the lives of the protagonists. Their story will assault your heart-strings as the past and her secrets unfurl leaving Rupert and Jess with no option but to confront all their issues head-on if they are to find a common ground to rebuild a future together. Life is tough, but somehow they manage to heal past hurts, concluding with a worthy happy ever after. First of all, I must comment on how stunning I find the cover. It is the front door to a book and despite every warning, people do judge a book by its cover. Jess and Rupert were best friends and childhood sweethearts. As they got older life pulled them apart. Due to friends getting married they meet up again a decade older and wiser. There was angst and pain aplenty but despite it all there was love. I thoroughly enjoyed this sweet second chance romance, There are some great other characters too First of all, I must comment on how stunning I find the cover. It is the front door to a book and despite every warning, people do judge a book by its cover. There was angst and pain aplenty but despite it all there was love. I thoroughly enjoyed this sweet second chance romance, There are some great other characters too . Rachel Burton’s writing is a pleasure to read. She has a wonderful way of weaving everything together and keeps a pleasing flow throughout. This didn’t feel like a rushed story. Rachel Burton is the bestselling author of The Many Colours of Us. Her new book The Pieces of You and Me is out now. Rachel has worked as a waitress, a paralegal and a yoga teacher and has never really known what to do when she grows up. She has spent most of her life between Cambridge and London but now lives in Yorkshire with her husband and their three cats. The main loves of her life are The Be Rachel Burton is the bestselling author of The Many Colours of Us. Her new book The Pieces of You and Me is out now. Rachel has worked as a waitress, a paralegal and a yoga teacher and has never really known what to do when she grows up. She has spent most of her life between Cambridge and London but now lives in Yorkshire with her husband and their three cats. The main loves of her life are The Beatles and very tall romantic heroes.